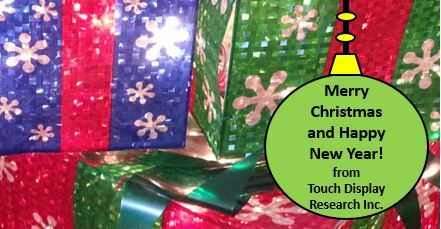 December 2015 - Touch Display Research, Inc.
We wish all our clients, industry friends and families a Merry Christmas and Happy New Year! Safe travels if you have to travel to see your loved ones. We look forward to continuing working with you in 2016. This entry was posted in Displays and tagged Happy holiday, merry christmas on December 16, 2015 by jennycolegrove. 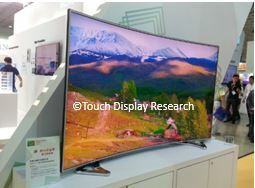 Recently, Cambrios invited Touch Display Research for an update briefing at their facility in Sunnyvale, California. I had a chance to catch up with my old industry friends: Cambrios’ CEO Mr. John Lemoncheck, VP of marketing Mr. Sri Peruvemba and Senior Director of marketing Mr. Raghu Gupta. 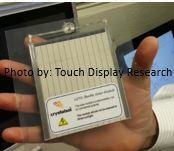 They showed me a flexible portable solar cell. Crystalsol based in Austria made the flexible solar panel with Cambrio’s silver nanowire transparent conductor–ClearOhm. The final solar product is selling for $70 each in Asia and Africa currently (not in US yet). Figure 1. Flexible solar cell using Cambrios silver nanowire ClearOhm. We also discussed Cambrios’ other design-wins in the touch panel side and the status of their joint venture with TPK. 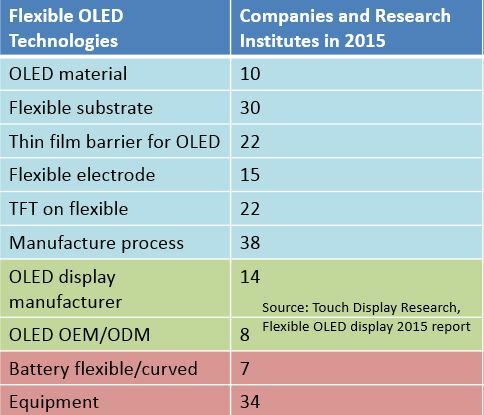 More analysis can be found in the “Touch and Emerging Display monthly report”, December 2015 report. It is in PDF format with over 50 pages and available immediately. License for this single month report is $600; license for 1 year (12 monthly reports) is $1900. You can subscribe on our website in the Market research report page. This entry was posted in Displays, ITO replacement and tagged Cambrios, flexible solar cell, silver nanowire, solar cell, Touch screen, TPK on December 9, 2015 by jennycolegrove.